From Gatlinburg: Drive 20 miles on the East Parkway Hwy 321 N for 20 miles. Then take a right onto Cosby Highway and follow this road for 1 mile. The entrance for Cosby Campground will be on the right. Drive on this national park road to the campground. You'll find a parking area just before you enter Cosby campground that serves as the trailhead for the Low Gap Trail. From I-40: Take exit 440 to Wilton Springs Road, US 321 S. After 2 miles, turn left onto Cosby Highway and continue for 9 miles. On your right, you'll see the national park entrance at Cosby. Follow this road 2 miles to the parking area for the Low Gap Trailhead. The hike to Mt. Cammerer is a strenuous hike over 11 miles in length. Luckily for hikers, this trail with a steady climb actually goes to one of the shorter elevation mountains in the Smokies. The peak of Mt. Cammerer itself rests at 4928 FT, far lower elevation than many other summits in the national park. If you're looking to escape the crowds and enjoy some peace on your hike – Mt. Cammerer is an ideal destination for your day hike. Both Cosby Campground and Mt. Cammerer are well off the beaten path. Most visitors to the national park never reach this section of the Smoky Mountains. Though this day hike is difficult, it's easily one of the most unique and stunning trails in the park. 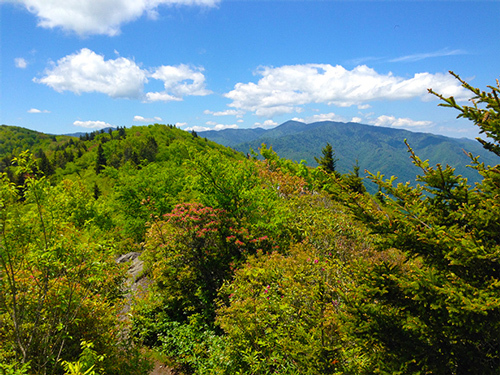 The panoramic views offer a unique perspective of the tall peaks of the Smokies. Better yet, the trail itself is gorgeous and passes through beautiful sections of mature hardwood forest. 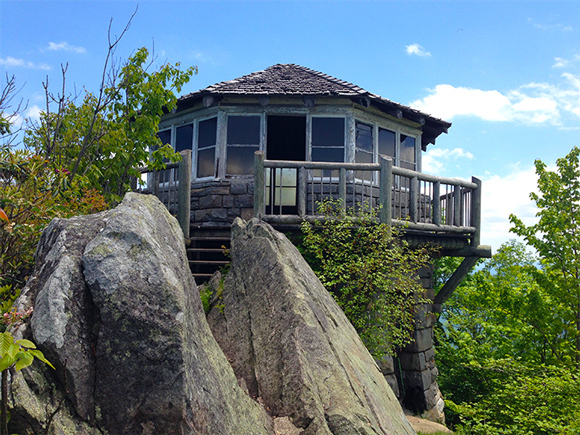 At the top, you'll find a historic, western style fire tower that was restored in 1996. The Low Gap Trail out of Cosby Campground is the shortest route to Mt. Cammerer, but it is also the steepest. The beginning of the hike can be somewhat confusing due to nature paths that surround the Cosby Campground. Obtaining a map from the ranger station near the parking area can help you find your way. Additionally, trail signs for the Low Gap Trail are well marked, so simply follow the signs. The first 2.9 miles on the Low Gap Trail is a long, steady climb up to the Appalachian Trail. About 0.5 miles in, you'll see the trail split onto Lower Mt. Cammerer Trail that serves as an alternate route, but Low Gap is a far shorter journey. As you hike, you'll be treated to arguably one of the most beautiful stands of forest in the Smoky Mountains. At the end of the Low Gap Trail, hikers will reach the Appalachian Trail and the high ridge at the Smokies. Turn left on the Appalachian Trail and follow this for 2.1 miles. Eventually, the steady climb off the mountain will level off and give you a change to rest. As you travel along the ridge, you'll be treated to views of Cosby. In spring, wildflowers are abundant on the mountain ridge. Before long, you'll reach a sign points to a trail that branches to the left. This trail that spurs off from the Appalachian Trail is rocky and requires some scrambling. Follow this an additional 0.6 miles to reach the main attraction – the rocky ridge and stone watch tower atop Mt. Cammerer. The watch tower on top of Mt. Cammerer is one of only 3 remaining fire towers in the national park. It is also one of the only stone towers in the Eastern United States. Built in the late 1930s by the CCC, this historic structure features large hand-cut stones that were hauled from a quarry 100 yards down the mountain. The tower was used for detecting wildfires until the 1960s. Once watchmen no longer lived in the tower, this historic structure fell into disrepair, but was restored in 1996. Today, it offers an excellent platform for enjoying the inspiring views from Mt. Cammerer. To the north, hikers will be able to see the Pigeon River Gorge and I-40 snaking southward through the Tennessee mountains. Additionally, the peak of Snowbird Mountain across the gorge is easily visible. To the southwest, the towering 6,000 ft peaks of the Smoky Mountains dominate the horizon. To the west, you'll see a large expansive valley that's home to the peaceful mountain community of Cosby. To the south, Mt. Sterling in the North Carolina section of the park can also be seen. Start Early and Take Your Time – This hike is long and strenuous even for experienced hikers. To complete a hike of Mt. Cammerer and enjoy yourself along the way, you'll want to allot enough time for resting and enjoying the views from the watchtower. Pack Food and Water – Since this hike is longer, it pays to bring plenty of food and water so that your group can stay fed and hydrated during their hike. Bring Trekking Poles – A pair of trekking poles will serve you well on the climb and the return descent of this hike. A walking stick can also make this hike more enjoyable and save your knees from unnecessary wear and tear. Set a Turn-Around Point – Calculate how much day light you'll have to complete your hike to Mt. Cammerer. To ensure that you won't have a return trip in the dark, set an appropriate turn-around time so you won't be caught by nightfall. Hiking Mt. Cammerer is a great option for vacationers who want to get away from crowds in the Great Smoky Mountains National Park. It's an excellent day hike that can easily be reached from cabin rentals in Gatlinburg, TN as part of a truly unforgettable Smoky Mountain vacation!